Ok so I will be speaking at the 9th Leap Africa’s CEO Forum. This is an annual event which provides a unique platform for Entrepreneurs, CEOs and Managers in the public and private sectors to interact and share insight on critical strategies and tools to promote business sustainability. The theme for this year’s forum is “Leveraging Technology for SME growth”, I will have 20 minutes to speak on “Managing Publicity and PR through social media”. This should be interesting as I am really looking forward to it. Social Media is something I work with on a daily basis as a result of my function, I manage a social media who manage communities for quite a number of brands. It’s a 20 minutes talk and I already have more than 30 slides 🙂 See you guys there. Other speakers at the forum will include Dr. Oscar Emokpae (Chairman; Mindshare Advertising Agency), Tunde Kehinde (Co-Founder Jumia), Abasiama Idaresit (MD Wild Fusion) and Professor Balvinder Powar (MD & Chief Communications Officer, Booster Industries (Spain)) who will all be sharing technical knowledge and personal experiences with a view to simplifying technology for small and medium-sized business owners. 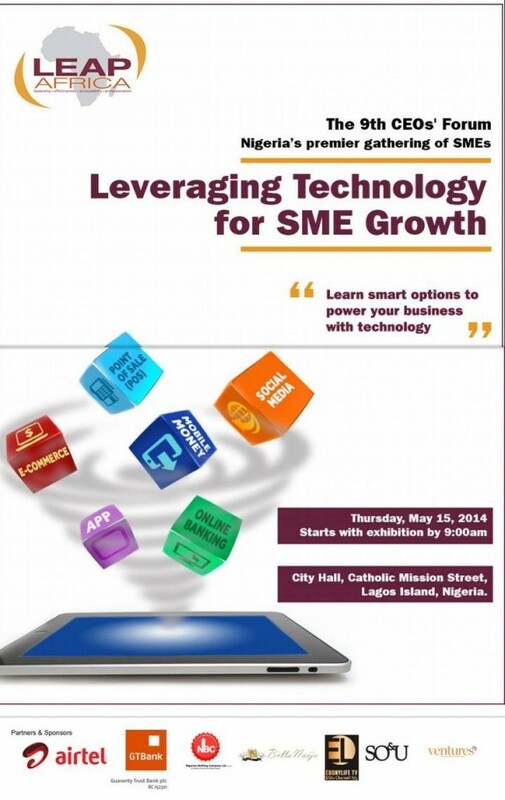 It will provide SMEs with cutting-edge technological guides, tools and skills to support business growth. The Honourable Commissioner of Commerce and Industry, Sola Oworuand CEO, Insights Abiodun Shobanjo, a seasoned entrepreneur, will also be present at the event. To attend, you can register and find details to the form here: www.leapafrica.org. Google and the Enterprise Social Business Space.